Nothing tastes better than fresh herbs. There’s nothing better than cooking something and walking outside and picking some of your own fresh herbs to add to your dish. Once you start cooking with them, it’s difficult to imagine cooking without them. A side benefit of growing your own herbs is that you can dry them and store them for use later in the year when you may not be able to grow them because of the weather. You save so much money when you have your own herbs. 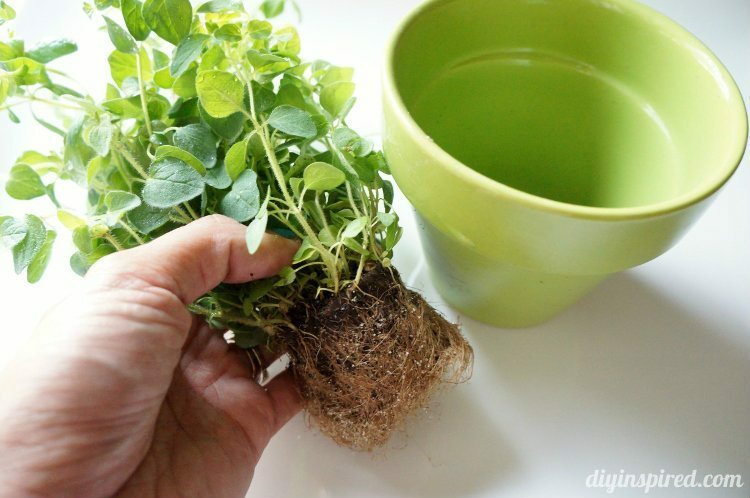 Here’s a few tips for growing your own herbs at home. You can grow these directly in the ground, if you have the room, or in pots. They are easy to grow, you’ll save money, and your food will taste fantastic. When you buy herbs, try to purchase 2-3 plants of each type and at different stages of growth. This way, they will mature at different rates allowing you to have herbs for a longer period of time. You will be able to use some of the larger plants while the smaller ones are trying to establish themselves. I look for those that are marked “organic”. Look for herbs that are healthy in the pot and look ready to eat. Repot the herbs as soon as possible. Leaving them in their original pots won’t allow the roots to spread out and they will suffocate themselves and die. (Make sure you don’t disturb the roots when you are repotting the plant.) Repot in pots 2-3 times the size of the original container. No larger, as too large and the plant will expend all its energy on root development, and very little on plant development. Repot in organic potting soil especially formulated for vegetables. Water well once you pot and then don’t worry about watering them again for a couple of days. The plant(s) may droop a bit, but that’s okay, they are readjusting to their new pot. They also need to be in partial shade the first day or two. None of the herbs mentioned here like to be over-watered. Pots that are plastic are better than clay as the clay ones dry out too quickly and can break easily. You can use virtually any plastic pot, such as a gallon milk carton with the top cut off and holes poked in the bottom as all pots have to have good drainage so the roots don’t rot. If you have pests on the plant, use a vegetable spray like an organic insecticidal soap . Be careful with what you’re buying, making sure it is specifically made for plants to be eaten. If your plants are outdoors, think about investing in some shade cloth. Herbs are sturdy plants, but they do need some protection from the sun and cold. I have found that some herbs, like dill, state that they can be placed in full sunlight, but, for me, they do not like full hot sun all the time. They do better when they have some relief from the hot afternoon sun, especially if that sun is accompanied with a hot drying wind. I find the same to be true of cilantro. Herbs like basil, thyme and oregano and parsley like to be kept moist, but don’t like overwatering and do not like direct sun, regardless of what the label that comes with them says. To keep your basil producing leaves, do not pick off just the leaves. Go to the stem, and see where the leaves come out of a little node, pick off the stem and leaves at the node. The node will regenerate another stem with more leaves. I planted thyme, oregano and rosemary plants 5 years ago, and I have never had to replant them. Chives like sun and regular watering. Again, I planted a few chive plants a couple of years ago and they stay green year around. All you have to do is clip off the stems as you need them. If they start to seed, clip them off as the plant may die back. These plants do not like full sun, and do best with morning sun and afternoon shade. Mint, the garden weed! If you want to grow something that has many uses in your kitchen, grow mint. It grows like a weed. And like weeds, it spreads and can take over an entire area. The best way to grow mint is to grow it in a contained area of your garden with borders around it, or in a pot so it can’t spread. It does like water, but isn’t a water hog. I hope some of these tips that I’m Giving Back will help you in establishing your own herb garden. The more variety of herbs you grow, the more you’ll want to try growing. One that I love is pineapple sage . It is a beautiful plant that stays green year around, and in addition, has beautiful small red blossoms on it once or twice a year. Part of the joy of growing your own herbs is drying them for sharing with friends and family and for later use. In another post, I’ll be Giving Back some tips for drying herbs. I’ve always wanted to grow my own fresh herbs but never knew where to start. Not only is it great to have them on hand, you know exactly how they were grown & a lot of the fresh herbs are expensive! Thanks so much for the great tips! The herbs I brought indoors are doing great! The basil had a difficult time though because I think our sunroom got too cold at night for it. Each night I brought it into the house and each morning moved it back to the sunroom. It’s worth the effort though. I’m so glad I did this because with spring coming I can just move these outdoors and won’t have to wait for herbs! I hope you tried growing some herbs and were successful! Thanks for writing. They are easy to grow and taste so good! Have fun enjoying growing and using your herbs! O my gosh I love love love this! I am pinning & following the wisdom soon as I want to try herbs again! I can’t wait to read what you come up with!! Well, I finally planted some herbs. (See my article on garden gates.) I also planted rosemary in the ground to use as a shrub in a corner of the yard. Rosemary is so sturdy it will be able to stand up to the cold winter that’s ahead for us. I found that when I work out in the yard here in Tennessee, the bugs stay away if I tuck some sprigs of fresh rosemary in my shirt pockets, in my hat and in the cuff of my jeans! It’s a great natural bug repellant and it smells good too! Where did you get the wire baskets for the pots? Hi Kim! I got them at Micheal’s Craft Store during a spring time sale last season. I live in Colorado. I’m curious if you recommend planting in plastics pots so I can bring the herbs inside and outside according to the weather? I just fear planting herbs in the ground as the weather can be so dramatic. Or do you have any advice on keeping the herbs safe outside? Im a total beginner here! Is there a time of year you recommend to start planting? Thanks for writing Maria! We have extremes in weather here too! I plant in plastic pots year around. I do not plant any herbs in the ground here. My herbs are in plastic pots in the sun room right now and are doing great! The basil has to be moved in the house each night then back to the sunroom during the day. I think the sunroom is too cold for them at night. But, having fresh herbs is worth it! Once I think spring is “truly” here (maybe another month) I’ll move my pots outside on their gates. I wrote another article you can check out about the metal gates I use to place my herbs on. I am starting some new herbs next week in plastic pots and around the end of March will move them outside to join the more mature herbs. I do not use seeds, I use small starter plants, making sure they are organic. This way I can be assured of success! 🙂 I hope this helps. Let me know how you do and if you have any other questions. I love this stuff! When planting mint outside, cut the bottom out of a 5 gallon plastic bucket. Bury the bucket to the rim leaving about an inch out of the ground, your mint will stay contained. Some people replace their lawn or portions of their lawn with mint! Wow! As long as you have mild weather year around I guess it would be okay. But, with the weather we have here in the south, the mint would die off during the winter and the result would be woody stocks on the ground. Because mint is so nice to cook with and to add to a variety of drinks, I like growing it and love the idea of containing it! Thanks for the information. I always believe what the label says and I’ve always had a hard time growing basil. Every area of the country is different. Others may have their own “success” stories about placing basil in the sun, but, for me, I’ve never had any good basil when I’ve placed it in direct sunlight. It does not like to have it’s leaves wet, just the soil kept moist, but not overwatered. The more you grow it, the more comfortable you’ll get with it and find your own best place to plant it. I’ve not had good success with growing it in the ground, always grown it in a pot – both medium and large size. And, by placing it in our sunroom for this winter and moving it into the house during the night, I’ve also had great success in the winter! Good growing with the basil! Let me know how you do! I love your advice. It is so multilayered. Thanks for writing about my article. Hopefully you’ll find something in the new one I recently posted, growing herbs successfully, strawberries too! We moved from CA to TN and though our roots are in place, this move is allowing us to grow in ways unimagined! I agree with your words! Thank you! This helped so much! Just started growing my own herbs and I can’t seem to figure out what they all want and need, this article cleared it all up for me. My Cilantro’s leaves, well some of them, has a slight purple Colour, is this normal? The plant is also still pretty young, about 2 months and was grown from seeds? Also, when do I harvest the Cilantro?